In November 2016, Chris Shearer, journalist with The Melbourne Anglican, joined Anglican Overseas Aid Board and staff members on a trip to Mozambique to see the impact of our work there. This article was first published in the December 2016 edition of The Melbourne Anglican. Reproduced with kind permission. The church’s walls are made of mud, its roof simple thatching. Past the earthen altar adorned with the image of Christ someone has painted an angel directly onto the dried mud. There are a few plastic chairs, but for the most part the people here sit directly on the ground, leaning against the cool walls. Children peer inquisitively through the windows at us, the visitors to this remote village in northern Mozambique. We’re here in the small village of Mucaria to see how the Diocese of Niassa’s Health and Wellbeing project, supported in this province by Australia’s Anglican Overseas Aid since 2010, is having a positive impact on the lives of rural communities throughout northern Mozambique. The project began in 2004 as the diocese’s first formal HIV and AIDS education program. 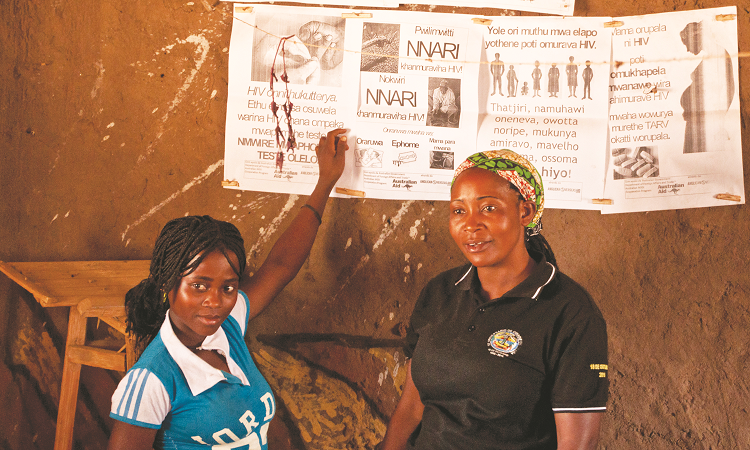 At that time it was estimated that over 16 per cent of Mozambicans aged between 15 and 49 had HIV, and poor education on the nature of the virus meant more and more were being infected. Those who became HIV positive faced growing stigma from the community, fuelled by myths like the disease could be spread by eating from the same plate or drinking from the same glass as someone with the virus. Misinformation abounded and Mozambicans suffered. These attitudes and beliefs were the first target of the Health and Wellbeing project, but simply going to these communities and telling them they were wrong wouldn’t have been effective. 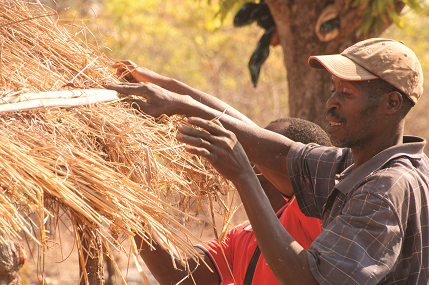 “We firmly believe that real good community development happens by the members of the community themselves,” explains Director of Mission for the Diocese of Niassa, Rebecca Vander Muelen, an American who has lived and worked in Mozambique for 13 years and now runs the diocese’s range of community development programs. She explains this is done through the Equipes de Vida – Portuguese for “Teams of Life”. A typical Equipa de Vida is made up of 15 to 20 people drawn from a cluster of nearby villages. They’re trained in their communities about key messages and then initiate responses to the most pressing issues. Each month they’re visited by the regional adeptos, or field workers, whose role it is to support the teams by helping to facilitate meetings with community and religious leaders, as well as planning, coordinating, monitoring and reporting on the community-led initiatives. Local catechists and priests help the adeptos coordinate and support the equipes. Also involved are the animators, a relatively recent addition to the project, who are also drawn from the community and work with three to four nearby teams. Essentially, they provide additional support to the teams so that adeptos only need to visit once a month or so – no easy task when crossing the diocese takes over 11 hours of driving on unsealed roads. The combination of distance and context-specific education has meant the project has been shaped into a sustainable, community-led program. While a significant amount of the project continues to centre on HIV, it has since expanded into other key messages. Equipes de Vidas across the Diocese now educate their communities on such broad topics as children’s nutrition, sanitation projects, gender issues and social support networks. After individual presentations in the church, our group is invited to watch a performance put together by the local Equipa de Vida. The village gathers beneath a canopy of dried grass and for a moment it’s unclear who is performer and who audience. But then all eyes turn to a man with exaggerated movements projecting his native tongue with an aggrandised tone – the local catechist. In the performance he plays the role of a man who contracts HIV, but decides to visit a witch doctor for treatment. Eventually, after no improvement, a friend carries him to a clinic, where he is tested, determined to be HIV positive and given anti-retrovirals to manage the virus. But in a cruel twist of fate, his community ostracises him, believing they might catch the virus from him through simple contact. For Anglican Overseas Aid CEO the Revd Dr Bob Mitchell, it’s an encouraging statement. “AOA is committed to community-led and strength-based development, which means that we do not dictate to partners what their priorities should be or how they should do their work. It is a dialogue which tries to leverage the partner’s existing capacities, priorities and local plans. In our experience this is the most respectful and effective way to work,” he says. Indeed, the energy of these communities and individuals is seemingly inexhaustible. Jorgito, an adepto whose area of responsibility includes Mucaria, has a simple explanation. It appears that when the church engages in the real issues and circumstances that affect the community, much more happens than is planned for. In the last 10 years, the Diocese of Niassa has welcomed over 200 new Anglican churches. For Dr Mitchell, it is a sign of what can happen when the church commits to helping communities develop and flourish. “When the church takes its responsibilities seriously – serving the local community in a grassroots way in the midst of its own grinding poverty – for many that’s an unexpected, and yet compelling proposition. There’s a message there that we can all learn from and celebrate,” he says. Bishop Manuel Ernesto of the Diocese of Niassa agrees that the project has definitely played its part in the recent growth, although is quick to make it clear that they’re not running the project seeking converts. Indeed, a number of beliefs are represented in the equipes or the communities they serve. In fact, Rebecca argues that the physical presence of churches in the rural areas was an important factor in the project’s early successes, as churches are often the only grassroots organisations in extremely remote communities. When she first arrived in Mozambique many rural communities were inaccessible, even by road, and NGOs tended to focus on helping the communities they could actually reach.